Must be water resistant and have a built in cover. Must have high quality waist straps – it’s your hips that take all the weight. Must have a single front buckle – nothing worse than fannying about, specially in the dark with 2 buckles. Plus, they always interfere with the poles if you have them attached. Must have loops etc for poles – which I’d probably use for the monopod. I’ve never used my poles in erm…9 years of owning them? Must have 2 side pockets, preferably one closable. Must have a pouch for a bladder and a waterproof exit for the mouthpiece. Must be able to open from the bottom as well as the top. Must have some spare loops and D rings to attach stuff to. It’s a Deuter as you can see, and again as you can see it has a single front buckle. *Tick! * It has tons of d rings and places to connect carabiners *Tick! * It’s got two side pockets, one which is zippable and will hold a flask *Tick! * It’s water resistant ripstop with a built in waterproof cover in the base *Tick! * The loops for walking poles is perfect for the monopod although at a push it could also take 2 poles too. *Tick! * You can access the main compartment from a bottom zip *Tick! * and it has a ‘flap’ on the back, adjustable, which perfectly holds my pac a mac and pac a trousers. *Tick! * The amount of adjustability is amazing, and I got this filled with some weight and fully comfortable in about 15 minutes. *Tick! * I love that it’s got a small zip pocket on the waist strap, and 2 zipped pockets in the lid. 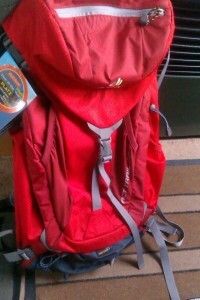 Looking inside, it also has a pouch for my 2 litre bladder and a little rain proof exit flap *Tick! * It has of course the great name of Deuter. Not that I go by names as you know, that way is folly. Perfect. How much? £55!!! “Bugger me” I hear you say “is that all?” Yep, that’s all. I found it on the web cheaper than they were selling so they price matched it. Nice one Cotswolds. Now my camera weighs about 3 pounds and the zoom weighs about the same. Add a flash, 2 triggers, some spare batteries, 2 Kgs of water, first aid kit and a load of other sundries and you have one heavy bag. But wearing this is a doddle. It is SO comfortable. Probably the most comfortable bag I’ve ever had in fact. I did go one day without using the waist strap and what a difference. I had aching back and shoulders and they ached a little for 2 days. Yet I can be out an entire day with it tied properly and not even feel it’s there. It’s official: I LOVE this rucsac!